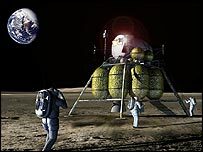 Could Google help to land humans on the moon again by 2020? Google is to build a new office complex on the site of Nasa's research facility in California, close to its own headquarters in Silicon Valley. It would look to "bring entrepreneurs into the space programme", Nasa added. 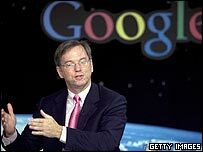 "Google and Nasa share a common desire, to bring a universe of information to people around the world," said Eric Schmidt, Google's chairman and chief executive. "Imagine having a wide selection of images from the Apollo space mission at your fingertips whenever you want it." "While our joint efforts will benefit both organisations, the real winner will be the American public," he said.